Detox tea. The words had always scared me a little, but had me curious at the same time. so I tend to stick to simple teas such as green tea, which I'm still trying to get used to the taste of! 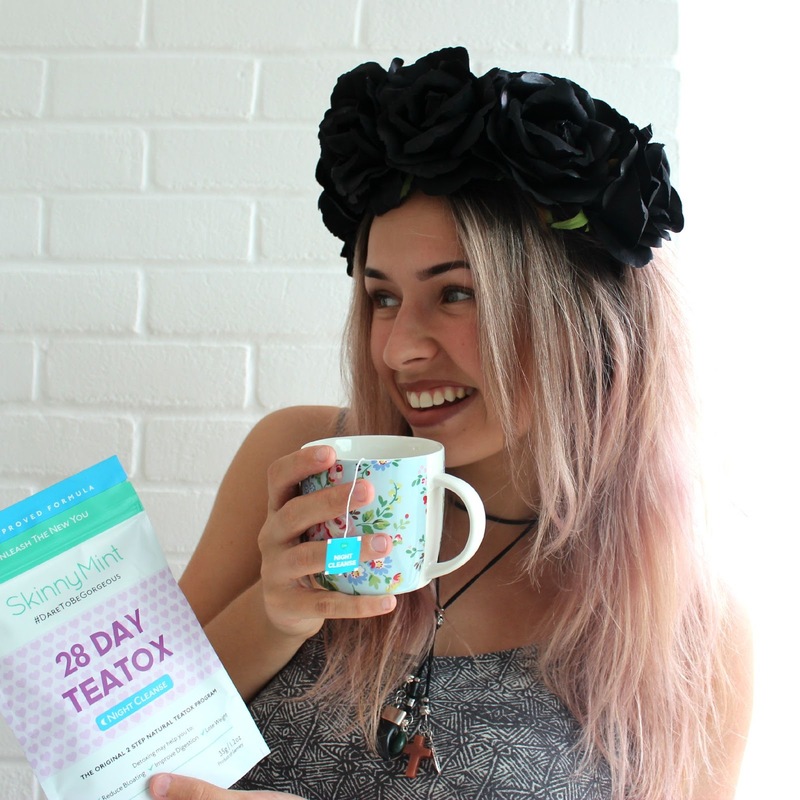 I will be reviewing SkinnyMint's 28 day Detox Tea in this post. I reached out to SkinnyMint in regards to putting their 28 day tea to the test, I was super excited when they got back to me and wanted to collaborate. I will be giving my truthful & 100% honest opinion on the product. That's what bloggers do after all right? Haven't heard of SkinnyMint before? 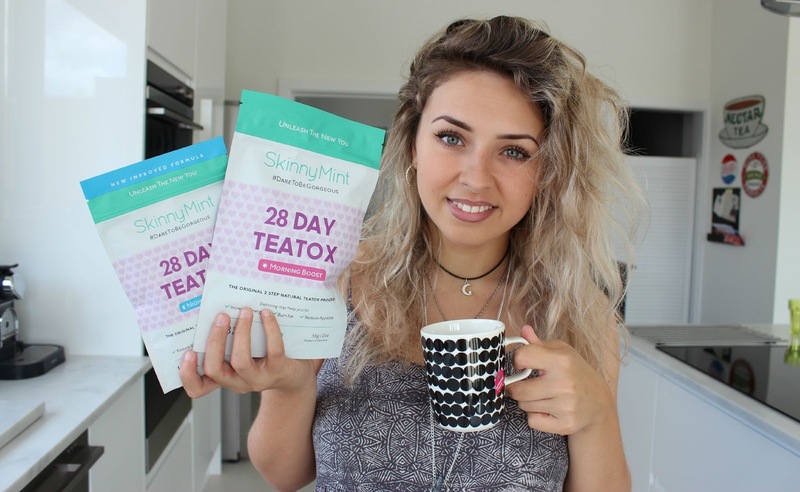 SkinnyMint are a 2-step natural detox tea that aims to help you achieve a freshly cleansed body with it's natural energy boosting & detoxifying tea bags. Prefer to watch a video review? Check out my 28 day journey review via Youtube by clicking here! SkinnyMint's teas interested me a lot. 2 different teas each day (well, the night cleanse on every other day) I decided to give the 28 day detox a go. The teas consisted of a 'morning boost' every day which consisted of gorgeous flavours such as grapefruit, strawberry & pineapple - as well as 14 night cleanse tea bags. 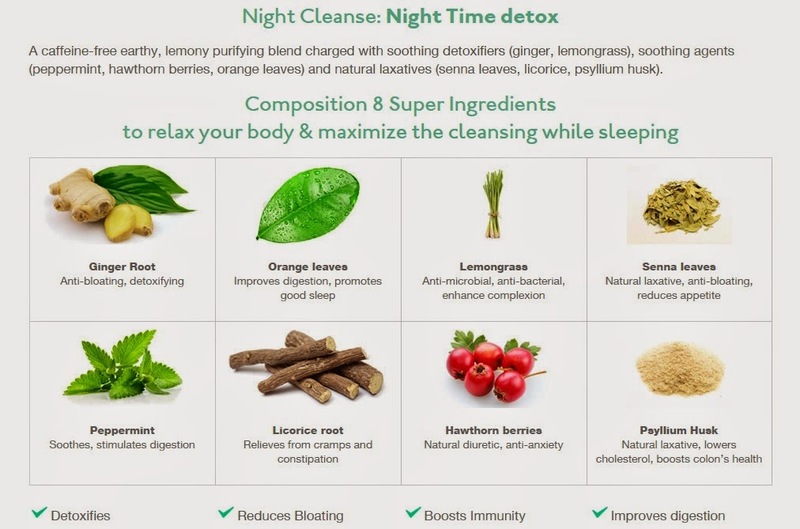 There is plenty of different ingredients in the night cleanse tea bags, each sip is seriously full of flavour! Expect to taste strong hints of peppermint, licorice, hawthorn berry & ginger. At the beginning of the detox I wasn't planning on making a huge difference to my diet plan or excersise regime. 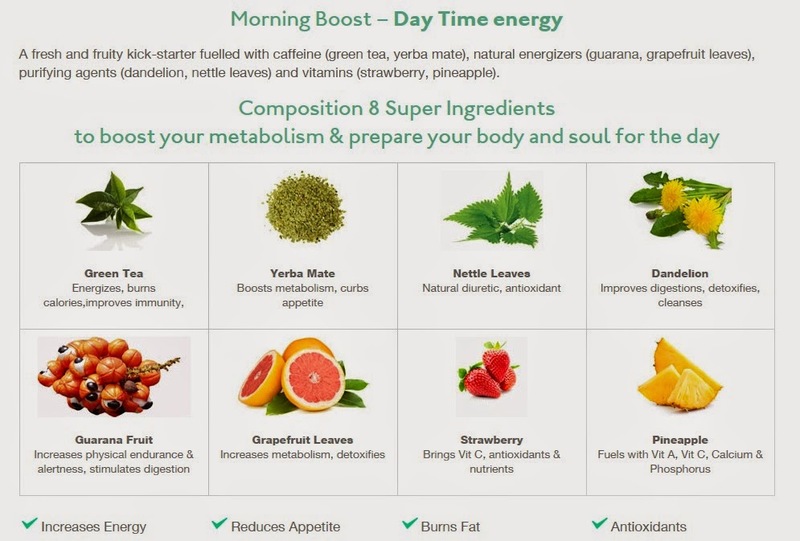 On day 1 I started the day with the morning boost tea. There is plenty of different options of experimenting drinking this tea, e.g with hot water, ice tea, cold fruit tea with oranges and raspberries, anything really! Have fun with it and try some different options if you're one to get bored of having the same thing everyday. I am usually one of them people, but I tried this hot and liked it, A LOT. I tried the ice tea a few times but I stuck with having the hot tea most days. On the back of the morning boost bag there is some different variations recommended. The energy tea sure did do its job. This tea had me feeling full of energy each day, I truly looked forward to having a tea each morning from day 1 onwards. This is unusual for me since I'm just not your usual 'cuppa' girl! But the bursts of varied fruit flavours had me at hello. And it's been a very successful 28 days. Not only did the energy tea leave me feeling ready for the day, it also left me feeling motivated on all levels too. I still snacked a lot during the 28 days. If you know me you know my never ending love for pancakes, which me and Jack have at least 2 times a week! So I didn't stop them. I did notice that the teas did reduce my appetite since the teas are pretty filling, it did state on the packet that it could do this but I didn't think anything would be able to reduce my crazy appetite! Here is a brief diary entry for each of my weeks on the teas! I wanted to keep the dialouge short and simple, for both my sake and your sake. Week one: My stomach was getting used to having the teas each day and getting comfortable with the generous use of the laxative but I was noticing a huge difference in my stomach bloating from my first day of drinking the teas. My stomach moved around a lot when I first started the evening teas, it felt like positive movements and didn't hurt me but I could feel that it was happening. Week two: Still settling in to drinking the teas each day, feeling a lot more energetic as the days went on. As the days went on I was getting a lot more used to the night tea, I loved how you could really feel the changes happening. FYI I wasn't glued to the toilet the whole 28 days, I was scared that this might happen but it wasn't half as bad as I thought it might be! Don't get me wrong, I was needing the toilet every day but I felt a lot better for it. I could totally understand the true meaning of the words 'flushing out' whilst on this tea. Week Three: In the start of my third week I realized I was half way through my teatox, and started to notice more tightening changes around my stomach area. I started trying out different ways to drink my energy tea, e.g with real fruits and ice to make the energy tea more of an iced tea! This was fab, it mixed up the week nicely for me having different variations to choose from! Week Four: In my last week I didn't want it to be my last week! I was feeling in a routine of these teas and didn't want to stop that. I've enjoyed the taste, the daily energy boost, and the outcomes of using this tea. I could notice more of a lifted effect on my stomach, I could tell this around my belly button area. I was loving waking up this morning feeling balanced and un-bloated! I didn't capture many pictures of my results, just one at the beginning of the 28 day journey and one after. You can see a difference around my belly button area. I weighed myself at the beginning of the 28 days, which I remember rightly I was 9st 12 - a few days before completing the tea tox I weighed in at 9 st 6 - seeing as I did little exercise, and ate what ever I wanted I feel like this was a great success for me. At the start of the detox tea I truly wanted to put it to the test to see if this tea would give me great results by doing very little with it. Just a quick overview; I'm giving my 100% honest opinion and saying I truly enjoyed this tea. I never stick to many things If it's for my own benefit so I'm proud of myself on this, but since the tea was super delicious it makes it all that little bit easier. My top tip is to keep the tea bag in whilst drinking, I loved topping it up some times for a second cup! I felt the taste was more stronger whilst it continued to brew in the cup. I'm super looking forward to using this teatox again, I'm going to do my next 28 day SkinnyMint tea in November just before Thailand! Then I'll really have my healthy non-snacking head on with a more regular exercise regime. Please note when doing 28 day detoxes it is not recommended to continue on and do it for a second month, it's recommended to have at least a months break beforehand. Would I recommend this to a friend? Most definitely! This is of course my personal experience using Skinny Mint, each of our bodies will react differently to the product. Try it, experiment and enjoy it! I'm genuinely gutted my 28 days are up, I'm missing my morning boost ahhhh! Have you used SkinnyMint before? I would love to hear your thoughts or concerns on detox teas! View more by visiting their website here. I may try this as it does seem really effective! "I could totally understand the true meaning of the words 'flushing out' whilst on this tea".